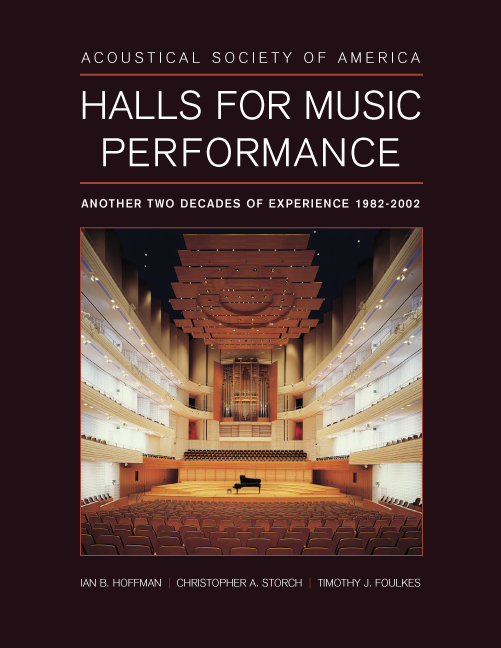 Halls for Music Performance - Another Two Decades of Experience is a 320-page, full-color, hardcover compendium, published by the ASA, which documents and celebrates two decades of development in music hall design. The book is a compilation of 130 music hall projects, from fourteen nations, that were initially presented in collective exhibition at the 141st meeting of the ASA, in June 2001 in Chicago, and at the 143rd meeting, in June 2002 in Pittsburgh. As editors, our role was to collect, organize, proof, scale and format the graphic, image and text content provided by the submitting acoustic designers, and to assemble it into a coherent bound resource. We also authored the front-end commentary which situates the book's content within the [then] current climate of concert hall design globally.